The sophisticated 3D synthetic vision feature combines a high-resolution global digital terrain model with GPS and obstacle data to create a visual representation of the aircraft's surroundings - in full 3D! 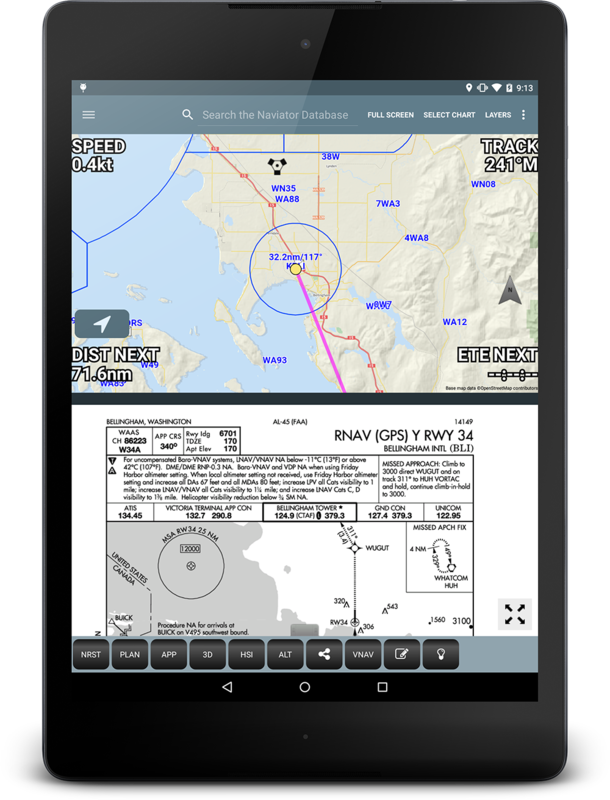 Naviator integrates with various ADS-B receivers as well as the Zaon PCAS XRX for real-time traffic display and verbal traffic alerts. Enter waypoint identifiers on the "Quick Plan" screen to build a route. Routes can be easily modified directly on the map with the intuitive "rubber band" feature. 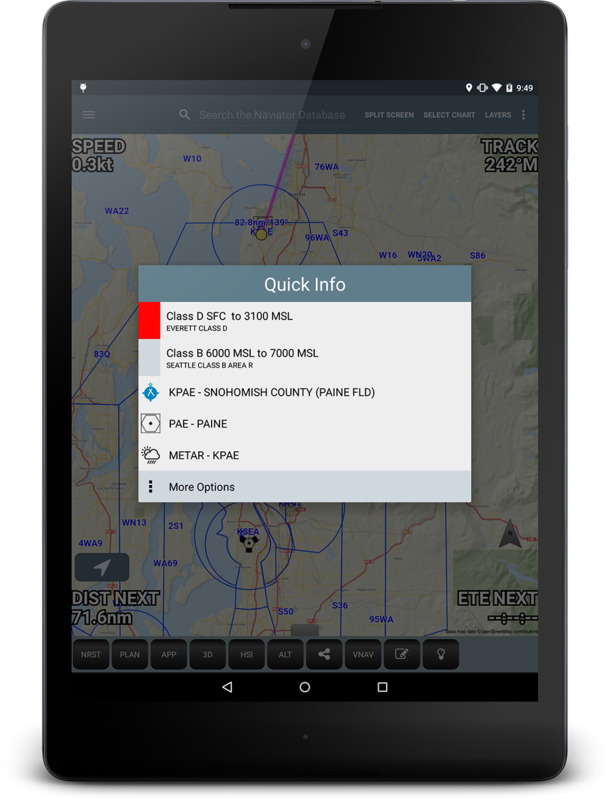 Get near real-time weather updates while in the air with a Bluetooth or WiFi enabled ADS-B receiver such as the Dual XGPS 170 or iLevil SW.
Naviator makes it easy to file FAA flight plans using either your DUATS or Lockheed Martin Flight Services account. 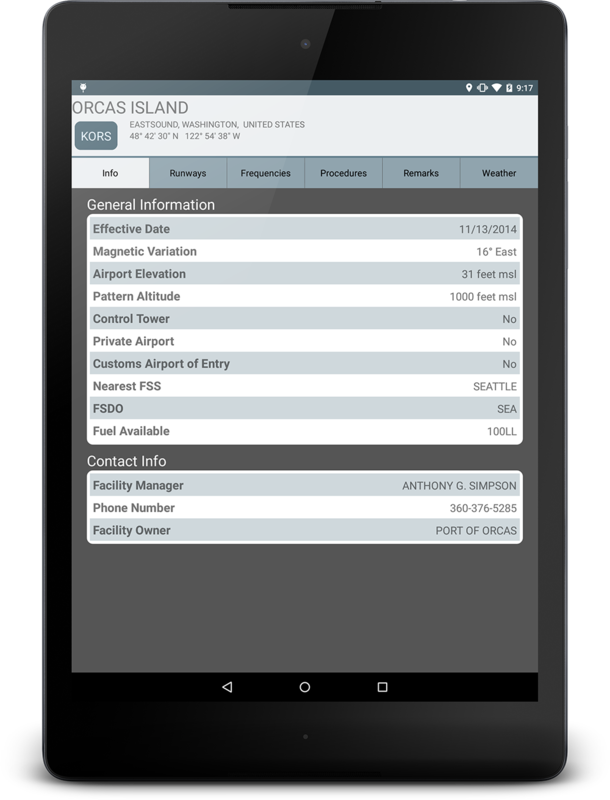 Need to fly to a location not in the Naviator Database? With Naviator it's easy to create or import your own user-defined waypoints. Naviator's sophisticated 3D synthetic vision feature combines a high-resolution terrain database with GPS data to create a visual representation of the aircraft's surroundings - in full 3D! Mountains, lakes, obstacles and towers appear as if you were looking out the windscreen. Obstacles and towers are displayed at their real-world heights and are color coded to warn of potential collision risks. If you get too close to an obstacle it will start flashing red and white. Terrain 500 feet below, or above the aircraft's altitude is tinted red to warn of potential collision risks. Naviator features winds aloft, NEXRAD, infrared satellite, METAR, SIGMET, AIRMET and TFR overlays on the map. 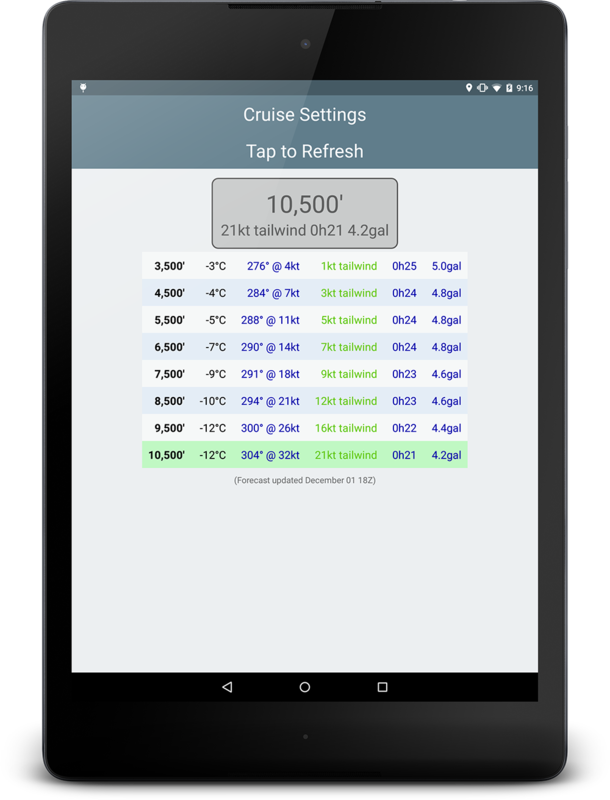 The weather and TFR data is continuously updated as long as an internet connection is available. For an unparalleled level of safety, connect Naviator to an ADS-B receiver and get weather updates while you fly! Naviator supports the industry standard "GDL-90" protocol, and has been confirmed to work with the following ADS-B products: Appareo Stratus 3 Dual XGPS 170 and 190, Flight Data Systems Pathfinder, iLevil SW and AW, L-3 Lynx, Open Flight Solutions FlightBox, FreeFlight Systems RANGR, SkyGuard TWX, uAvionix pingBuddy, and Stratux with official support for more ADS-B receivers coming soon! Our proprietary Global Forecast Engine can provide forecast winds aloft at any location on the planet up to 54,000', and up to 48 hours in the future. The Altitude Optimizer feature predicts the optimum altitude for your route of flight based on our state of the art Global Forecast Engine data. Estimated time en route and estimated fuel usage are calculated based on aircraft performance data for altitudes in 1,000' increments. With Naviator it's possible to split your tablet's screen into two sections. This flexible feature allows you to view the information you need most without ever having to leave the map. 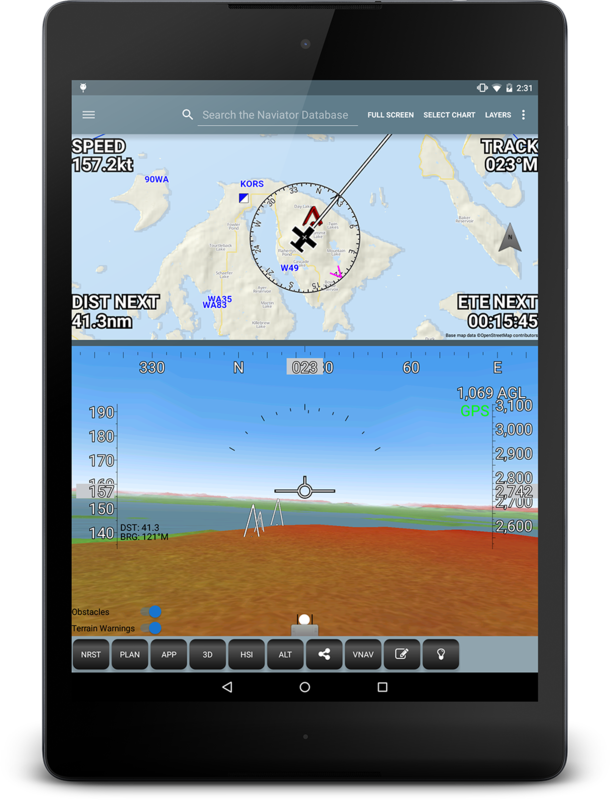 For example, you can display an IFR en route chart on the top half of the screen with a 3D synthetic vision view displaying below it. The image above to the right shows the split-screen feature in action, with the base map on top and an approach chart below it. With Naviator's "Quick Info" feaure all the information you need during a flight is only a single tap away! Simply tap anywhere on the map and a Quick Info popup will appear with information about everything on the map at that location. 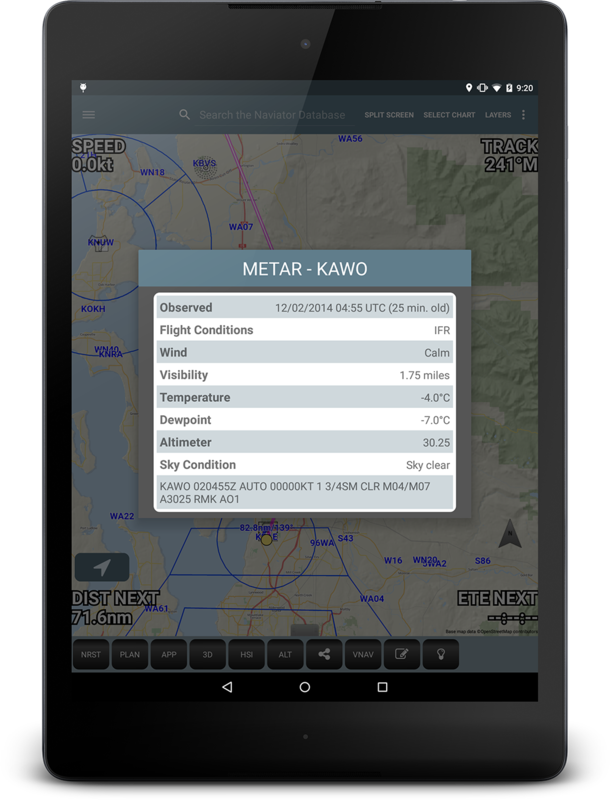 Airports, airspace, radio navaids, weather updates and more - only a tap away! The Naviator database features over 53,000 airports and navaids from all over the world, including private airports! Updates are issued every 56 days consistent with the ICAO AIRAC cycle. Naviator can optionally record your flights so that they can be exported to common formats used by many mapping applications such as Google Earth, or upload them to your own personal Naviator Hangar to quickly and easily share your flying adventures with your friends! To see an example flight on Naviator Hangar, click here. The Flight Following feature functions similar to other GPS tracking products (such as SPOT™), but with Naviator there is no additional monthly fee! When enabled, the Flight Following feature continuously sends your GPS position to your personal Naviator Hangar in real-time as you fly. You can choose to share your Hangar page with your friends and family, or include it in your flight plan to keep Flight Services aware of your location in case of an emergency. If you have a custom map you'd like to use, no problem! 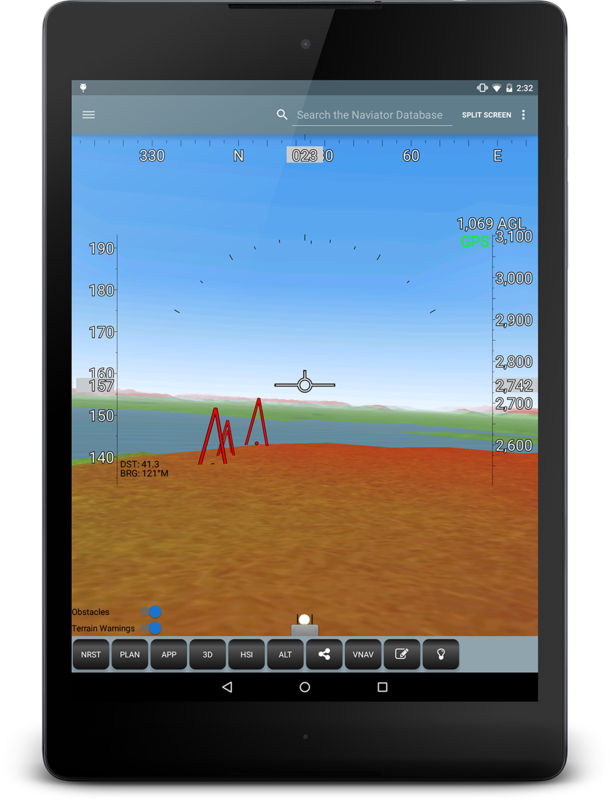 With the BYOC feature you can import any geo-referenced chart into Naviator. With BYOC, it's possible to import any chart you need. 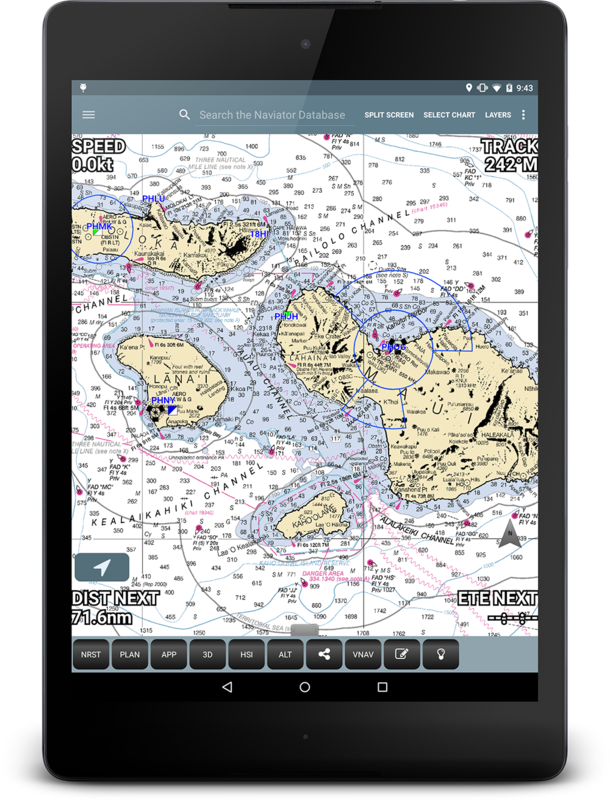 In the image above to the right a marine chart for the Hawaiian Islands is displayed in the Naviator app.